Avant Game: I invented the cookie goggles. I invented the cookie goggles. Originally uploaded by Avant Game. Perfect for sight seeing in Barcelona. 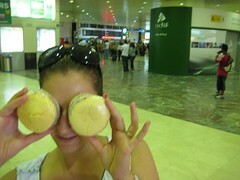 More photos from my cookie rolling installation (with alfajores) in Barcelona are in this slideshow. As you can see, I installed a period... which means, I have reached the end of my first sentence in the essay! My Secret Burning Man Game - Please Help!